Andrea Meyerson is an award-winning creator of film and television programming as well as a producer of live comedy shows and concerts. As president of StandOut Productions she has produced and directed more than 25 feature films, television specials and series episodes which continue to air on U.S. networks. In 2002, Meyerson produced and directed the award-winning comedy documentary LAUGHING MATTERS. The success of the critically acclaimed film spawned three sequels: LAUGHING MATTERS...MORE! (2006), LAUGHING MATTERS...THE MEN (2007) and LAUGHING MATTERS...NEXT GEN (2008). The Laughing Matters series is available on DVD and in frequent rotation on TV. 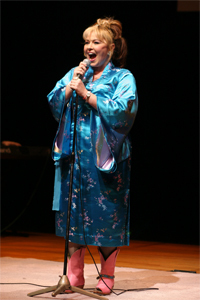 In 2007, Meyerson began creating original television programming, including numerous comedy specials spotlighting popular comics such as Alec Mapa (Ugly Betty, Desperate Housewives), Kate Clinton (The L Word), Suzanne Westenhoefer (Late Show with David Letterman, HBO Comedy Half-Hour), Jessica Kirson (The Tonight Show with Jay Leno, Last Comic Standing), and many others. She also directed and executive produced 10 episodes of the series ONE NIGHT STAND UP, each of which showcases a group of diverse comics. She has just completed the documentary I STAND CORRECTED, which she produced and directed. The film is scheduled for release in early 2012. 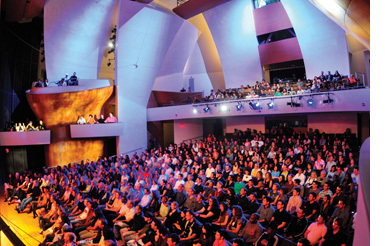 Meyerson is also a prolific producer of concerts and live comedy shows. 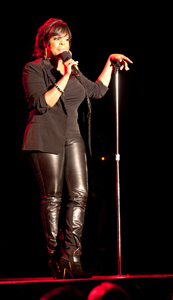 Since founding StandOut Productions in 1997, she has staged events featuring some of the country's best-known comics and musical artists including Wanda Sykes, Roseanne Barr, k.d. lang, Brandi Carlile and Joan Armatrading. The recipient of numerous awards for her activism in the areas of LGBT and women's rights, Meyerson was the recipient of the Los Angeles Gay & Lesbian Center's L.A.C.E (Lesbians Active in Community Empowerment) Award in 2002.. PowerUp honored her as one of the "10 Amazing Women in Showbiz" in 2004. In 2006, she received the Outstanding Woman Award from the Women's Image Network and was one of three finalists for PlanetOut's Entrepreneur of the Year. Andrea made history in 2007 when she became the first out lesbian to receive the YWCA's Women of Achievement Award in Arts & Entertainment. In March of 2008, Andrea was honored with the prestigious Human Rights Campaign's "Local Hero Award." Meyerson is also the founder of Women On A Roll, one of the country's largest organizations for lesbians.